Lynne Ramsay's work bears a powerful personal imprint. Her films are marked by a fascination with children and young people and the recurring, unresolvable themes of grief, guilt and, above all, death and its aftermath. They are low on dialogue and explicit story exposition; instead, they look to bold, unusual images, vivid details, an astute use of music and highly wrought sound design to create their unsettling worlds. Bill Douglas and Terence Davies have been cited as points of comparison, but her films are very much the product of an original vision. Born in Glasgow on 5 December 1969, she studied photography at Napier College, Edinburgh, then entered the National Film and Television School , where she specialised in cinematography and direction. 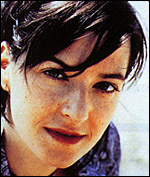 Her graduation film, Small Deaths , vignettes of three disquieting moments in a young girl's life, won the Prix du Jury at Cannes in 1996, a feat which the writer-cinematographer-director repeated two years later with her third short, Gasman , a child's-eye-view of family tensions at a Christmas party. Her debut feature, Ratcatcher (1999), explored a working-class childhood in Glasgow in the early 1970s - not too different from her own - against the backdrop of chaos and decay caused by a refuse collectors' strike. The portrait of a 12-year-old boy consumed with sorrow after accidentally causing a friend's death, it was unveiled in Cannes' Un Certain Regard section and won a BAFTA award, among many others. Morvern Callar (2002) was Ramsay's first adaptation from other source material, in this case Alan Warner 's 1995 novel about a young woman from a small town in Western Scotland who hopes to use her boyfriend's sudden suicide as her springboard to freedom. Samantha Morton garnered great praise as the luminously amoral and enigmatic central character, although the film itself met a more mixed reception. A hiatus followed, but for other reasons. Ramsay read Alice Sebold 's The Lovely Bones as a half-finished manuscript and in 2001 signed up to write and direct the film adaptation. Once again, it begins with a death, of a 14-year-old girl who, in heaven, watches her family reacting to her murder. But although apparently ideal for Ramsay, the project got caught in creative differences and, when the book became a bestseller, Steven Spielberg acquired the rights. In 2004 she was dropped in favour of Peter Jackson , whose (poorly received) version appeared in 2009. In 2006 Ramsay agreed to adapt another American bestseller, Lionel Shriver 's We Need to Talk about Kevin , a study of the fraught and complex relationship between a mother and her son, who grows up to become a multiple murderer. Budgetary difficulties held this production up too. But, after several script drafts, the film, which employed a fragmented, elliptical narrative and was crowned by a stellar performance from Tilda Swinton as the tormented mother, premiered in 2011 to great acclaim at the Cannes Film Festival . In 2002 Ramsay married the musician Rory Stewart Kinnear , who worked with her on the script for We Need to Talk about Kevin .